We love talking beer. This channel aims to provide a holistic look at beverage practice across the US using beer as a lens. Reiser Legal PLLC serves breweries throughout the United States for matters of federal law—from USPTO trademark representation, through to TTB licensing, COLA labels and beyond. We are also licensed in the states of Washington, Colorado, and Louisiana, where we provide complete beer law services to breweries in those states. How did the Brewery Law Blog get started? When we created the Brewery Law Blog, our goal was to produce a dialogue on interesting regulatory and legal issues affecting Washington state breweries. We’ve watched our beer industry grow exponentially over the past few years—with that success comes exposure to complicated legal dilemmas and increasingly oppressive legal regulation, along with a pressing need for proactive brand protection through smart trademark law practices. The Brewery Law Blog provides up-to-date information about the matters that should be troubling brewing businesses, and potential ways to address and alleviate those pressures. Brewery Law is brought to you by Reiser Legal PLLC, a Seattle-based law office focused on representing breweries and related industry businesses. 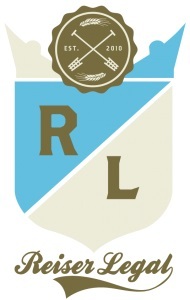 Reiser Legal helps established and start-up breweries navigate a variety of legal matters, including comprehensive federal trademark and intellectual property management, with nationwide business representation before the United States Patent and Trademark Office (USPTO) and the Trademark Trial and Appeal Board (TTAB). Offering experienced legal counsel from start-up to launch, with industry experience negotiating sophisticated distribution agreements and partnering on plans for expansion, Reiser Legal PLLC is a full-service craft brewery law firm with a passion for what we do. The office is managed by Douglas Reiser, a beer attorney and LEED AP, licensed in Washington and Louisiana. The office also includes Danielle Teagarden, a craft brewery attorney licensed in Washington and Colorado.